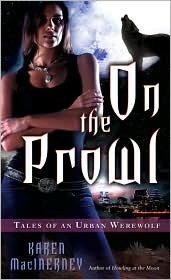 Karen MacInerney brings to life Sophie Garou in her Tales of an Urban Werewolf series - Howling at the Moon, On The Prowl, Leader of the Pack. Deserted by her father as a toddler, Sophie and her mom, a full-blooded witch, work and live in Austin TX. Staying away from the werewolves had been easy for two decades, but within these three books Sophie takes the fast track from secluded loner to facing the leaders of the local pack. In Howling at the Moon, Sophie races to clear her mother of murder when she is accused of selling one of the members of the city counsel a poisoned potion. With her best friend and coworker Lindsey, Sophie not only discovers the actual murderer, but in turn is discovered by the Houston pack enforcer, Tom Fenris. On the Prowl brings Sophie to further into the sights of the Houston pack. While trying to navigate her relationship with her boyfriend Heath, she finds herself meeting one of Texas's most eligible bachelors, and her new client. Sparks fly out of control in all directions as the pack makes her an offer she cannot refuse - spy for them or die. With Leader of the Pack, Sophie's long-estranged father Luc Garou appears during the werewolves' annual Howl to reconnect with her - and establish her power as the daughter of an Alpha. However best laid plans are dashed when Luc is accused of murdering another werewolf and sentenced to death by the Houston Alpha, Wolfgang. Although unsure of her father's motives for showing up now, Sophie isn't going to let him die without a fight. Sophie Garou is a treat to read. She could easily come across as a bit spoiled, and Sophie definitely enjoys her clothes, shopping and tv. However her heart is in the right place, and she defends those she cares about through the books. Having been a lone wolf for so long, the involvement with other werewolves who discover her intrigues and upsets her along the way as the rules binding packs starts to affect her life. Trying to balance her love for her human boyfriend, Heath, with her secret life as a werewolf starts to strain, and her interests in both werewolf Tom and client Mark make her humanity more present. MacInerney is able to introduce a lot of detail in the dialogue of the characters, while still keeping them light enough to not be too gritty for those who like paranormal romance. The romance is certainly there, but not the focus. I have been reading MacInerney's other series, The Gray Whale Inn Mystery series, and this is far step away in storyline, but filled with her descriptive prose and a moving plot that kept me reading. Those who enjoy Carrie Vaughn's Kitty Norville or Chloe Neill's Merit will find a similar lead voice in Sophie Garou.